“Emmet Cohen is a consummate jazz artist. His compelling recordings and performances reveal a harmonic sophistication, musical sensitivity and rich tonal palette...We are delighted by this recognition of Emmet’s unique talents by APA," said Bonnie Barrett, director, Yamaha Artist Services New York. The competition, run by the American Pianists Association (APA), concluded on April 6 at the Hilbert Circle Theatre in Indianapolis and was the culmination of a months-long process in which five finalists complete a residency at an Indianapolis high school orchestra or jazz band. During visits to the schools, the finalists' performed sets at The Jazz Kitchen which were judged and counted toward their overall score. Additional concerts at The Jazz Kitchen and Hilbert Circle Theatre on Friday and Saturday formed the rest of the scores. 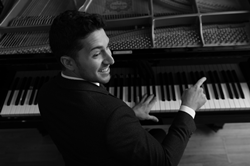 The mission of the American Pianists Association is to discover, promote and advance the careers of young, American, world-class jazz and classical pianists. We celebrate the beauty of music through America's premier jazz and classical awards. The American Pianists Association nurtures the artistic growth of America's top young pianists by focusing on creative expression and career development. Our largest and most prestigious support is given through a biennial competition known as the American Pianists Awards. Since our founding in 1979, the American Pianists Association has supported 46 winners.